Here’s All You Need To Know About Talking Tom Pool Android Game By Outfit7. Are You Ready To Build Water Park With Talking Tom, Talking Angela, Ginger, Ben? Outfit7’s Next Game “Talking Tom Pool” Is Coming Out At The End Of November For Android On Google Play Store. And I’m Sure In A Short Span Of Time, Talking Tom Pool Game Will Hit Million Downloads. 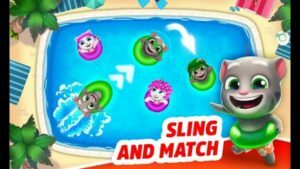 Talking Tom Pool Is A Sling, Bounce, And Match Game. All Of Your Favorite Characters – Taking Tom, Talking Angela, Hank, Ben, Ginger Are In A Pool. You Have To Clear The Pool By Matching The Same Color Floaties. Telescope – Use This To Improve Your Accuracy. Rocket – This Will Remove All Floaties Of One Color In A Single Time, And Unicorn Flotie – This Will Turn All Floties. Grab Chilli Pepper For A Big Power Boost. Several Types Of Pools With Different Types Of Obstacles Are Featured In This Game To Make Gameplay More Exciting. Complete Levels To Get Keys. You Can Use Keys To Unlock, Build, And Customize The Water Park. Talking Tom Pool Comes With Over 100 Levels, Excellent Graphics, And Superb Gameplay. You Build Ships, Food Place, Pools, And More To Build Best Water Park Ever. Talking Tom Pool Will Available For Download At The End Of November. You Can Pre-Register Talking Toom Pool On Google Play Store And Be The First One To Play The Game. Price – Free(Contains Ads, In App-Purchase). Size – __, Status – Pre-Register. Download – Here(Google Play Store).